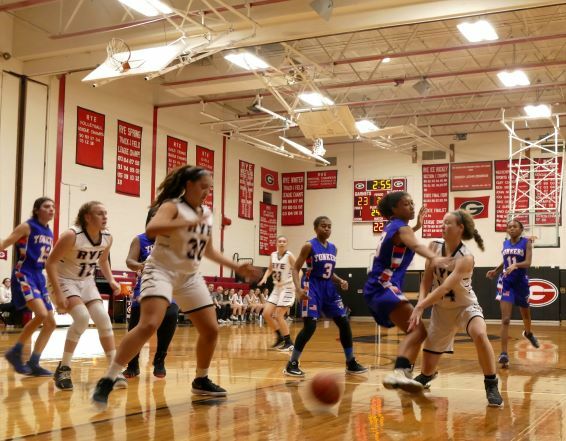 After struggling on both sides of the court for a few games, the Rye High Girls’ Basketball team went back to the fundamentals in their 60-35 win over Yonkers at home January 22. The Garnets set the tone for the first quarter with Teaghan Flaherty’s three-pointer off the opening jump ball. On the other side of the court, Rye’s Amanda Latkany grabbed the rebound and then sank a three for emphasis. Julia Bateman scored from inside the key before Yonkers got on the board on a foul shot at 5:42. On their next possession, the Garnets ran out the 30 second clock because they were passing so much. Then Flaherty hit a left-handed hook shot followed by Latkany’s swish from the post. The Bulldogs started to claw their way back but after a fast break layup by Bateman and a beautiful swish by Niamh Carty from the top of the key, the Garnets had a 15-9 lead at the end of the quarter. In the second quarter, Rye failed to control the defensive boards. The Bulldogs seized the opportunity by getting off two to three shots in a row and closing the gap to four. But the Garnets quickly righted the ship and led 32-19 at the half. Rye’s offense dominated the third quarter as their play execution set them up for a lot of inside shots. Flaherty hit a layup for two, was fouled, and sank the freebie. Then Bateman scored off a rebound. Greto shot from underneath, drew a foul, and made the foul shots. Shortly thereafter, due to their great rebounding, Rye got off four consecutive shots. Greto drew another foul and sank both. By the end of the third quarter, the Garnets had a commanding 20-point lead. Despite committing four team fouls in the last quarter, the Garnets secured the win. Flaherty led the charge with 15 points, Latkany had 12, and Greto added ten. Bella Krslovic made two three-pointers when the team needed them most. Coach Dennis Hurlie agreed. “It was a game we needed to win. We got off to a fast start and knocked down some shots. We were still getting good looks in the second quarter but did not take advantage. Yonkers gained confidence on the offensive end and made some tough shots. Our ball movement was better than it had been recently and making the extra pass got us some good shots all game. Caption :Niamh Carty makes a bounce pass to Ava Greto inside the key.